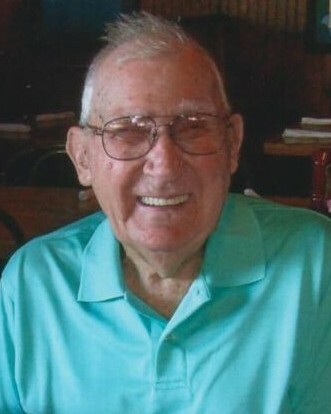 Leland F. Kerr, 93, passed away Wednesday, August 29, 2018 after a brief illness. He was a long time resident of Harlingen, most recently at Retama Manor Nursing Home. He was born in Fine, NY on June 14, 1925 to Emery Kerr and Muriel Loucks Kerr. Leland was the oldest of 8 children, of which 2 remain Lawrence of Fine, NY and Leonard (Marie) of Massena, NY. Those preceding him were Lila, Llewellyn, Lowell, Laverne and Lucy. He is also survived by numerous nieces, nephews and cousins. Leland joined the Army Air Corps in August 1943 and eventually landed in Harlingen for training. He met his long time love, Ruth Linsteadt (deceased) and they married August 11, 1946. Leland enjoyed the climate in the Valley and never missed the cold and snow of upper New York State. He was happy to take his family on trips to visit his family up north, but never in the winter! He and Ruth had two children: Linda Kerr Murray and Michael Kerr (deceased). Their grandchildren Kevin (Ann) Murray, Kate Murray Flynn (Pat), Maureen Murray (boyfriend Daniel Burton) and great-grandchildren Brendan, Maddie and Olivia Murray and Colin Flynn were dearly beloved. Leland was a graduate of State University of New York at Canton, NY. He grew up on a farm, studied agriculture and for many years kept chickens at his home in Harlingen. He maintained an interest in the University, occasionally attending class reunions. He also attended the Durham Business School in Harlingen. Leland worked for the U.S. Postal Service, walked routes in Harlingen and drove a rural route also. He had an amazing memory of the folks he serviced. He was very active in the American Legion, Disabled American Veterans and 40 and 8 Service Organizations. He held many leadership positions; both locally and at the state level even State Commander for the American Legion. He was proud of his military service and was committed to working for other veterans. He was a lifelong stamp collector and was a member of the NARFE. Leland enjoyed sports and volunteered as a youth baseball coach for several years. He was a faithful attendee at HHS football games. Leland rooted for the Cowboys, but was an avid Spurs fan. He enjoyed traveling throughout the United States. His passion was reading and was never without a book or two handy. Graveside services will be held Tuesday, September 4th, 10 am at Harlingen-Combes Cemetery. Visitation will be Monday, September 3rd from 5 pm to 7 pm at Buck Ashcraft Funeral Home, 710 Ed Carey Dr., Harlingen. In lieu of flowers, memorials may be made to Loaves and Fishes of Harlingen, 514 S. E Street, Harlingen, TX 78550 or a charity of your choice. The family would like to thank Dr. Brian O’Donnell and his staff for their long time care. Also, Retama Manor - Veterans Wing, for their dedication. Our appreciation to Mildred Baker, sister-in-law, for all she did.